"Yin and yang" is formed in pair from ancient Chinese philosophy. They represent a way of thinking and are regarded as the law of universe in ancient Chinese culture. The primary meaning of Yin and yang is primitive, originates from pictographic character, and refers to the different side to the sunshine. The side facing sunshine refers to Yang, and the side back to the sun refers to Yin. The conception of Yin and Yang originated from western Zhou dynasty. Bo Yangfu in 8 B.C. explained the earthquake using yin and yang that he attributed the cause to disharmony of these two elements of substances movements inside the earth. Hereafter, Zhou Yi (I Ching) made some summaries and indicated that everytihng is a part of whole; no entity can ever be isolated from the relationship to other entities. Ever since then, attributes of two opposite aspects of interrelated things are explained with yin and yang. In the course of their daily life, ancient Chinese people came to understand that all facets of natural world could be seen as having dual aspect, such as day & night, brightness and darkness, upward and downward, warm and cold, etc. Thus the terms of yin and yang are introduced into their life and gradually the specific doctrine appeared. Generally speaking, things and the phenomena that bear the properties of cold, dim, static, descending and astringing pertain to yin. The yin and yang properties of things are relative, not absolute. The yin or yang properties of things may vary with the change of time and application. Take anterior day and posterior day for example, the former one pertain to yang and the latter one being yin. The winter comparing spring is colder, so it is considered yin. Yin and yang and the transformation between each other, the black colour represents yin and the white one represents yang, the white spot in black refers to yang within yin and vice versa. Yin and yang oppose each other. This is so evident to see that black and white, bright and dim, dry and moist, water and fire as two opposite parts in nature, so do yin and yang. Nature with opposition and restriction bear the equilibrium and harmony. Yin and yang depend on each other. In TCM, neither yin nor yang can be ignored as the general pathogenesis for human body disorder is dysfunction of yin and yang. Yin and yang wane and wax between each other. Each of them coexist in a dynamic equilibrium in which one waxes and the other wanes. In other words, waning in yang leads to waxing in yin and vice versa. Either yin or yang reach the extreme level, the equilibrium boundary is no longer remaining thus come the disease. Yin and yang transform between each other. Under certain conditions, either yin or yang may transform into its counterpart. 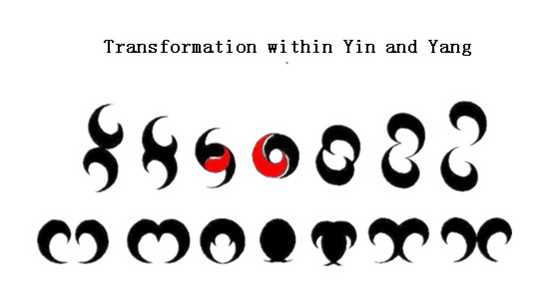 Extreme yin transform into yang and extreme yang transform into yin. Extreme cold brings on heat and extreme heat brings on cold. Pathologically, yin syndrome can be transformed into yang ones and vice versa. For instance, in some acute hot diseases, the vitality of the physical organism is greatly consumed and damaged due to excessive accumulation of heat. Therefore, if there is high fever and profuse sweating, sudden collapse of yang qi may occur and the patient's temperature will drop suddenly, the complexion will grow pale and the four limbs cold. This is a yang syndrome transforming into a yin syndrome. On the basis of long term practice, medical scientists in ancient China utilized theory of Yin-Yang in this field, explaining the origin of human life, physiological phenomena, pathological changes, guiding the clinical diagnosis and treatment methods. Yin and Yang theory became an important part of the theory of traditional Chinese medicine and played an extremely profound influence on the formation and development of the TCM system. Theory of yin and yang holds that daily activities of human being result from the coordination between yin and yang in the unity of opposites. For instance, functions of human body pertain to yang while substance pertain to yin. Physiological activities depend on substance. Without substance, there would be no sustentation for the functional activities. The functional activities are the motivators for the production of the substances in human body. In other words, without functional activities, the metabolism of the substance will be impossible to carry out; without necessary substance, the functional activities would have no chance to perform. Pathologically TCM considers that the imbalance between yin and yang is one of the basic pathogenesis of disease. And in the traditional treatment, the doctor first determines the therapeutic principle and then decides the medicines to be prescribed. Medicines with cold nature belong to yin and the warm ones pertain to yang. For the flavor of the herbs in TCM, the sour, bitter and salty ones in taste belong to yin and those acrid, sweet and bland in taste are yang. On the whole, the method of choosing herbs in TCM is to follow the decline trail of each side, either yin or yang in human body, or, either substance or functional activities to choose the correct herbs.